The life of Aaron Alexis, the man who went on a killing spree at the Washington Navy Yard on Monday, has been described as a “study of contrasts,” from being heralded for his heroism on September 11, to having numerous run-ins with the law. 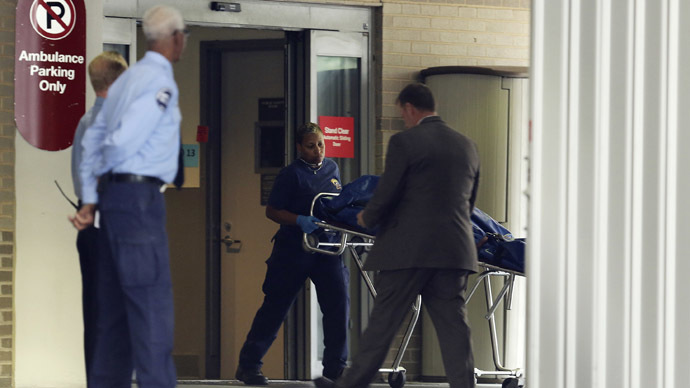 It appears that the navy yard gunman had been treated since August by the Veterans Administration for serious mental illness, AP reported citing its sources. He had apparently been ‘hearing voices’, suffered from paranoia and a sleep disorder. US authorities are still trying to piece together exactly who Aaron Alexis was, and what drove him to gun down 12 people in cold blood and injure another eight. However, they already have a rough sketch of the cold-blooded killer. While many expressed initial fears that the incident was somehow connected to Islamic terrorism, the reality came as a shock. Alexis, a 34-year-old information technology specialist and former Navy reservist from 2007 to early 2011, was also a convert to Buddhism who grew up in New York City. Although Alexis had run-ins with the law over shooting incidents in 2004 and 2010 in Fort Worth and Seattle, and was portrayed in police reports as “seething with anger,” it does not seem the Navy had any misgivings about working with him. 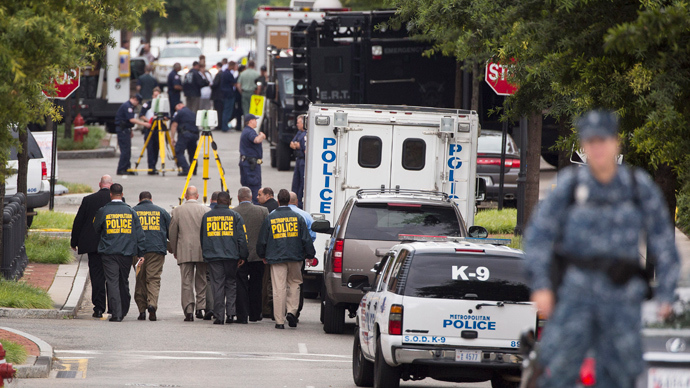 He reportedly had 'secret' clearance at the Navy Yard. "He did have a secret clearance. And he did have a CAC [common access card]," Thomas Hoshko, CEO of The Experts Inc, told Reuters. Hoshko explained that the contracting company was helping service the Navy Marine Corps Intranet as a subcontractor for HP Enterprise Services, a subsidiary of Hewlett-Packard Co.
Alexis had previously worked in Japan for The Experts from September 2012 to January 2013. The company is described on its website as being a "global provider of IT, engineering, telecom and business process solutions...supporting the war fighter abroad and domestic policy at home." 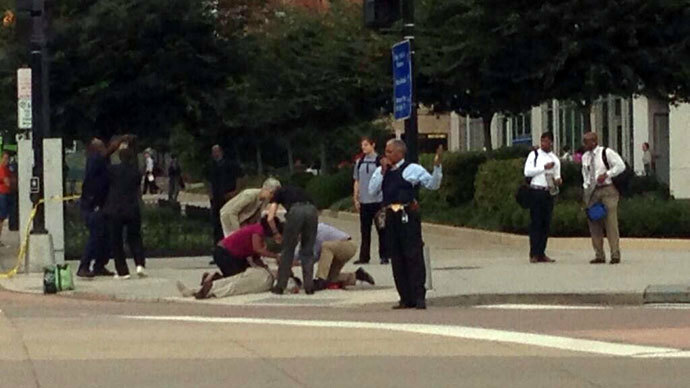 US officials are also trying to piece together how the shooter managed to breach security at the Navy Yard armed, witnesses say, with an AR-15 assault rifle and a shotgun. Alexis was even able to wrestle a handgun from a police officer at the scene, according to two federal law enforcement officials who spoke on condition of anonymity because they were not authorized to discuss the investigation, CNN reported. Mondays' shooting comes less than a month after a military panel recommended the death sentence for US military Army Major Nidal Malik Hasan, who killed 13 and injured 30 others at the Fort Hood military base in Texas on November 5, 2009. Judging by comments from people who knew Aaron Alexis - who tragically cut short the lives of 13 people, including his own – he did not come across as a visible threat. "Pretty nice guy, didn't say anything much, you know, just said hello and kept moving,” said Calvin Belton, a neighbor of Alexis’. “He didn't strike me as anything was wrong with him." However, below the surface of his apparent neighborly congeniality lurked signs that he was suffering from internal demons. His own father once told detectives in Seattle that his son suffered “anger management problems” related to post-traumatic stress initiated by the terrorist attacks of September 11, 2001. In 2004, Seattle police said Alexis was arrested for shooting out the tires of a vehicle in what he later described to police as an anger-fueled “blackout,” AP reported. According to an account on the police department's website, two construction workers had parked their car in the driveway of their worksite, next to a home where Alexis was staying. The workers reported seeing a man, later identified by police as Alexis, exit the home next to their worksite, pull a gun and fire three shots into the rear tires of their vehicle before he walked slowly back to his home. Police eventually arrested Alexis and booked him into the King County Jail for “malicious mischief” after finding a gun and ammunition in his room. According to the police report, Alexis told investigators he felt he had been “mocked” by construction workers the morning of the incident. Alexis also claimed he had an anger-fueled “blackout,” and could not remember firing his gun at the vehicle until an hour after the incident. He also told police he was present during “the tragic events of September 11, 2001” and described “how those events had disturbed him” without providing further detail. On May 5, 2007, Alexis enlisted in the Navy reserves, serving through to 2011, according to Navy spokeswoman Lt. Megan Shutka. While in the reserves, Alexis received the National Defense Service Medal and the Global War on Terrorism Service Medal, medals issued to personnel who served abroad and in the United States since the 9/11 attacks. Alexis' last assignment was as aviation electricians mate 3rd class at the Naval Air Station Joint Reserve Base in Fort Worth, Shutka said, as quoted by the Associated Press. It was during this time that Alexis had another run-in with the law after a neighbor who lived above him reported she had been nearly struck by a bullet shot from his apartment. Fort Worth police questioned Alexis in September 2010 about the incident. He admitted to firing his weapon, but said the gun accidentally discharged while he was cleaning it. Alexis was arrested on suspicion of discharging a firearm, but Tarrant County district attorney's spokeswoman Melody McDonald Lanier said the case was thrown out after it was determined the weapon discharged accidentally. A former acquaintance, Oui Suthametewakul, said Alexis lived with him and his wife from August 2012 to May 2013 in Fort Worth, but things didn’t work out because he wasn't paying his bills. Suthametewakul said Alexis had converted to Buddhism and attended the local Buddhist temple. “We are all shocked. We are nonviolent. Aaron was a very good practitioner of Buddhism. He could chant better than even some of the Thai congregants,'' Ty Thairintr, a congregant at Wat Budsaya, a Buddhist temple in Fort Worth, told AP. “He was a very devoted Buddhist. There was no tell-tale sign of this behavior,” Thairintr said. In the early 2000s, Alexis lived with his mother in Queens, NY, said Gene Demby, of Philadelphia, who said he dated one of Alexis' younger sisters at the time. He said Alexis and his two younger sisters had a difficult relationship with their father, who divorced their mother in the mid-1990s. Meanwhile, Embry-Riddle Aeronautical University confirmed that Alexis was enrolled as an online student via its Fort Worth campus. He started classes in July 2012 and was pursuing a bachelor's degree of science in aeronautics. For live updates on this developing story,click here.